Hello March! I'm full on throwing a temper tantrum over hear because it's March and still nasty as ever outside, come on spring come on, I can't wait for you to get here! I don't know if it's just me getting older, but I am definitely getting more impatient with these winters each year. 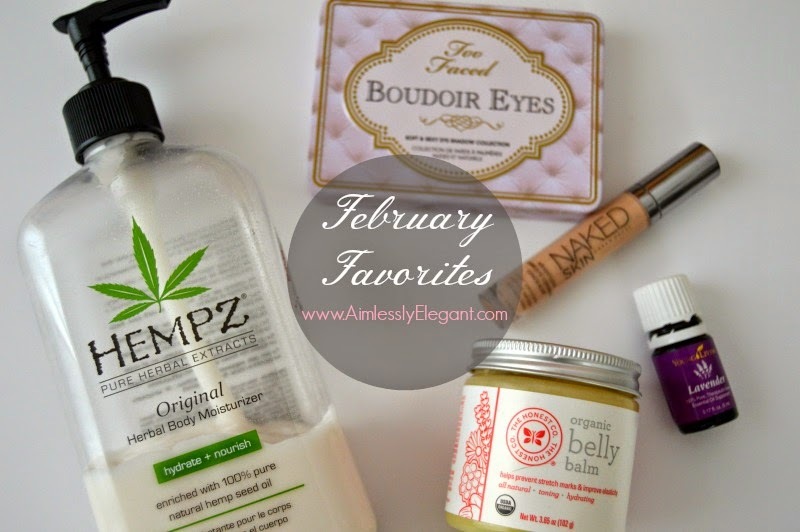 Now that a new month is upon us, here is a little look at some of the products that I was loving in February. This is for sure an oldie, but still a favorite. My college roommate introduced me to this stuff, and though it's on the pricier end for lotion I snagged this bottle at TJ Maxx for half price and I love how moisturizing it is. While everyone around me has been complaining about dry itchy winter skin, mine has been just fine this month. I like that this lotion is light weight, and soaks in quickly, and has a nice scent, but it doesn't stick around for too long. My Urban Decay Naked Skin Liquid Foundation has been a favorite of mine since I first gave it a try over a year ago. I've tried a few other foundations and always find myself back with my Urban Decay, so when I found out they were releasing a concealer that was a part of the same line I was excited to give it a try. So far, it does not disappoint. I've been using it primarily for my under eye area, and not only does it provide great coverage, it also has a brightening affect to it which is great for those dark under eye areas. It stays put all day without caking or falling into lines on my face, so far so good. This is the first, and only belly cream I've used so far this pregnancy, but I am determined to keep those stretch marks at bay. I've mentioned time and time again I love my Honest Company stuff, so I knew I wanted to give this one a try when the time came. It's thick and moisturizing, without being heavy and greasy. I've been using this in combination with a few drops of my Young Living Lavender Essential Oil mixed in because a friend told me she avoided stretch marks while she was pregnant with twins by using a combination of oil and lavender. Lavender is known for it's affects on the skin, and it's a calming oil which helps the body to adapt. *Click here to give The Honest Company a try, I do receive an incentive if you order through my link. I tend not to stray too far from my eye shadow favorites, but last time I was in Ulta I picked up this new palette and I'm loving it so far. The colors are right up my ally, and I love the little guide that comes with it giving you a how to to create three different looks. The only downfall is I don't feel like these shadows are on the powdery side, you can tell by the palette, you rub your brush in them and they seem to go everywhere. But I've already used almost every color on there, which is big for me because I tend to stick to my two favorite shadows day in and day out. Why did March have to make it’s appearance with the worst weather week yet?! I have to try out that too faced palette!! Stopping by from the link up to check out your Feb. faves! 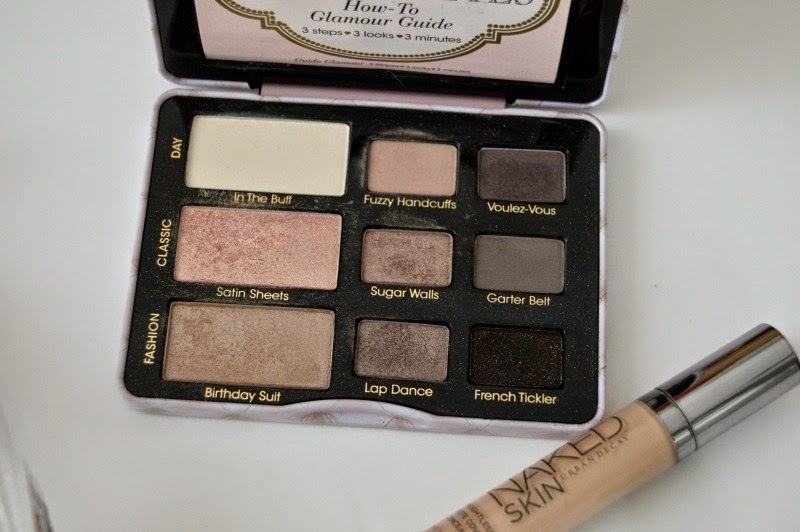 That eye shadow palette is gorgeous! Thanks for sharing ;) Have a lovely day, Aimee! That palette is so pretty. I will have to remember that about lavender oil & stretch marks! Ok I REALLY love those colors on that palette. I don't super need one right now but I really want one now after seeing this. :) So good to know about the lavender! I use it for so many things and hope to use it for that someday! Thanks for linking up, Aimee! Thanks for stopping by Brenda, I'm totally loving my new palette which is unusual for me, I usually stick with my go tos! So far I definitely think the concealer is worth the price, the only thing I'm curious is about how long the tube lasts, if it's anything like the foundation I'll feel like I got my money's worth! That shadow palette looks gorgeous! I had no idea UD came out with that concealer, and I've heard great things about that lotion. I'll keep an eye out for it at TJ! I keep hearing so many good things about that concealer- I like that it gives coverage while brightening at the same time. That looks like such a gorgeous palette- satin sheets is one of my favorite eyeshadow shades. Right?! At least things are hopefully supposed to look up next week! Check out the palette, I'm loving it! I'm crossing my fingers it's true and does the same for me! Do we ever need more beauty supplies? ;) I love my lavender too, I hope what it says is true in this case!